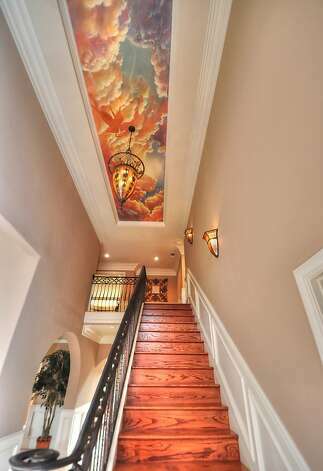 You’ve seen walls done to death, but have you considered making a feature of your ceiling? Decorated ceilings fell out of fashion after the Second World War when such a thing was considered frivolous and ostentatious. Now 2018’s most dramatic trend sees the oft-ignored “fifth wall” take centre stage once again, bringing a creative whimsy back to our homes after years of pared back details. Painting ceilings in a contrast colour can take an ordinary room to new levels and add interest. A continuation of your wall colour onto the ceiling, on the other hand, can actually make your room look bigger by drawing the eye upwards. Painted or stencilled patterns and murals on the ceiling add interest and tonnes of fun. They can be particularly striking in children’s rooms and rooms with sloping ceilings. Similarly, a wallpapered ceiling in a bold design can also add an accent to the room without requiring as much skill and time. Built in lighting features can really draw the eye to your ceiling and create a beautiful opulence and warmth. Use mirrors to reflect the light from an up-lighter back into the room for a really interesting look. Panels and beams will create light and shade.